In honor of St. Patrick's Day, garden artisan Scott Cohen of Green Scene Landscaping & Pools shares his top 50 water and energy conservation tips for turning your backyard into a green scene. Reduce your lawn size and increase planters and pathways. People love to stroll through a garden, and large lawn areas are no longer a requirement. Scott Cohen is the creative force behind The Green Scene Landscaping and Pools, a premiere outdoor design and construction firms in the Los Angeles area. Unlike many other designers, Scott is a licensed contractor in landscape, pool, & general construction, enabling him to service every phase of a project. 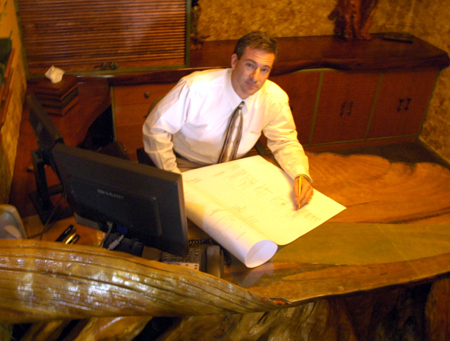 He is constantly pushing the envelope with new creative construction techniques and developing his management systems to deliver unparalleled workmanship and professionalism to his clients. In honor of St. Patrick's Day, he has put to together 50 practical tips for water and energy conservation. 1. Water more deeply but less frequently. Run sprinklers less often to allow soil to dry and air to get into the small cracks that develop, but water longer to get the water down deep and encourage healthy deep-rooted plantings and lawns. 2. Compost kitchen waste. Using a backyard composter will help reduce the amount of trash that ends up in the dump. Biodegradable kitchen waste makes for terrific natural fertilizers and mulch. 3. Run your sprinklers early in the morning so that water gets a chance to percolate down before the sun rises and evaporates the water. 4. Install a rain sensor on your sprinkler timer. New wireless systems are easy to install and cost less than $100. The sensor shuts off the sprinkler when it rains so that during the next downpour your money isn't pouring down the drains. 5. Use a shredder mower and leave grass clippings on the lawn. Decomposing clippings release water and nutrients back into the soil. You’ll reduce the number of plastic bags in the landfill and decrease your fertilizer needs. 6. Apply a “wetting agent” to your soils, lawn, and planters to break the surface tension of water and reduce runoff. You can buy a product off the nursery shelf, or make your own wetting agent by mixing one tablespoon of biodegradable liquid dishwashing soap in a hose end sprayer once a month. 7. Reduce lawn size by adding pathways. Lawn areas that get a lot of foot traffic from pets and people become difficult to maintain due to compaction. Install crushed gravel or decomposed granite pathways instead. 8. Reduce water pressure on sprinkler systems. Often times the water pressure is too high and sprinklers mist, causing much of the water to blow away from the intended areas. When you reduce water pressure it enlarges the water droplet size and water lands where intended and not at the bottom of the driveway. 9. Mulch your planter beds every 6 months with 1 inch of shredded urban forest product. Mulch helps with moisture retention and weed abatement, which means you’ll use less water and herbicides. 10. Split your sprinklers to water lawn and planter areas separately. Lawns require deeper watering and usually less often than planter areas. 11. Plant seasonal color and annuals in pots or just a few “hot focal spots” in the garden. Annuals require a lot of frequent watering. Rather than over-irrigate the whole garden, choose a few focal points and plant your color in pots than can be easily put on drip system. 12. Plant deciduous trees, which lose their leaves in the winter, on the south and west side of your home to reduce power usage. Proper placement of deciduous trees provides shade in the summer, but allows sunlight through in the winter, substantially cutting your air conditioning and heating bills! 13. Use recycled glass as a mulch in planter beds. Recycled glass can be purchased in bulk from companies like American Specialty Glass and spread out as mulch in planter beds to add color . 14. Landscape your garden with edible plants. We might as well get some return for all that water, fertilizer, and hard work. 15. Convert landscape lighting to new LED low voltage bulbs. These new super-bright landscape lights are easy to install and just sip power. 16. Reduce lawn size by adding a family fun feature like a bocce ball court or ping pong court area. Use decomposed granite or sand for play court areas. 17. Use stale beer instead of poisonous baits to trap snails. They are attracted to the fermented smell and party till they drown. Set used pie tins with about an inch of stale beer in the trouble areas. 18. Change slope sprinklers to rotor-stream type instead of spray heads. Low precipitation rate sprinkler heads, like rotor-streams put water down at ¼ the rate of spray heads, giving water a chance to soak the root zone instead of running down the drains. 19. Grow vegetables in raised pots and planters to reduce insect activity and limit pesticide use. 20. Install a grey water recycling system for your house to irrigate your landscape. 21. Collect rainwater and excess surface water to use for watering plants and hanging baskets. I’ve seen simple homemade systems using plastic trash cans under gutter downspouts work just fine. 22. Check your sprinkler coverage with cups or mugs. Proper sprinkler coverage equals less wasted water and happier plants. Set cups out in the lawn and planter areas and run your sprinkler system through a cycle. If water level is uneven, make adjustments to the sprinkler nozzles or location until you achieve uniform coverage. 23. Hire a professional landscape designer or contractor to design and install your irrigation system. Hiring a trained and licensed professional will ensure you have the most efficient system available. 24. Plant vines on your patio covers to create more shade and help cool the area. While people perspire to cool themselves, plants transpire and evaporate moisture to cool themselves, creating a natural mist system that can cool a patio by as much as 15 degrees. 25. Convert your planter sprinklers from spray heads to drip systems or micro-spray heads. Cover tubing with mulch to reduce critters that like to chew on tubes. 26. New sprinkler timer offerings include weather stations that watch the daily temperature and compare it to historical almanacs. They save you money by adjusting the frequency of watering needed to accommodate actual site conditions. 27. Add moisture sensors to planter areas in lawn and planter areas that communicate with your sprinkler timer to let it know when it's time to water. 28. Exchange your grass for faux turf products. They have gotten better looking over the years, but are still very hot to walk across. Keep that in mind when using faux turf around areas you might use barefoot, like around a pool. 29. Do a “sprinkler audit” every 4 months. Check to make sure sprinkler heads are not broken or spraying concrete, nozzles are not clogged, filters are clean, and coverage is proper. 30. Reduce your lawn size and increase planters and pathways. 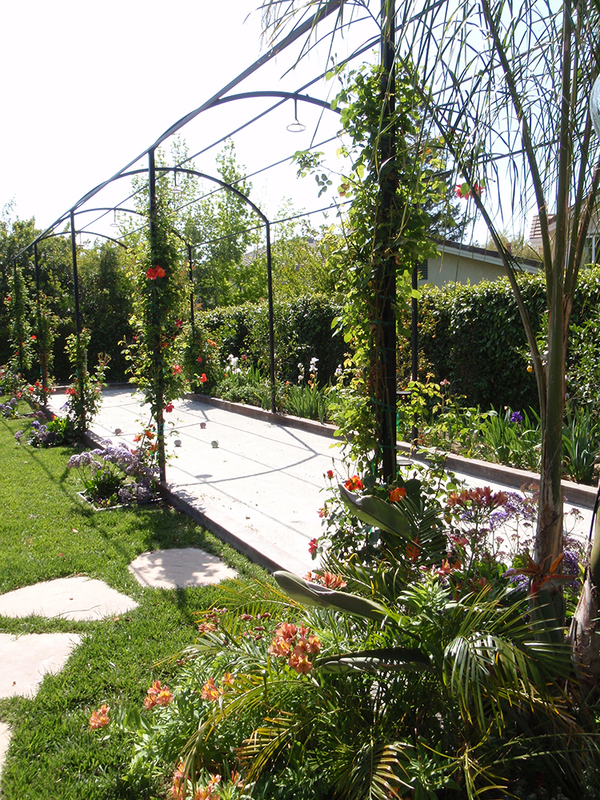 People love to stroll through a garden, and large lawn areas are no longer a requirement. 31. Add a sandbox to your backyard design. Dogs love to dig in them (see my Petscaping™ book), kids love them, and if you don’t have kids or dogs, then call it a Zen garden and run a rake through it. 32. Amend your soils with perlite to break up heavy clays and help aerate the soil. Plant roots bring water up through osmosis and grow much deeper in less compacted, well aerated soils. 33. Choose plants that are native to your area. Drought tolerant plants don’t have to be only succulents and cacti. 34. Install colorful flowering succulents instead of seasonal color. Use variegated foliage to add interest year-round with less water. 35. Zone your sprinklers for sun and shade areas. This will allow you to properly manage water use. 36. Use an app like Sun Surveyor to determine sun and shade patterns on your property all year long. Movie directors use this app to figure out what the shoot schedule will be on any given day. You can use it to figure out the best tree placement, sprinkler zoning, and patio cover locations. 37. Place a bubble pool cover on your pool to retain heat and reduce evaporation and chemical use. A covered swimming pool actually uses less water than a grass lawn the same size! 38. Change your pool pump to a variable speed pump to cut your utility bills by 20%. 39. Install solar heating panels on your roof to keep your pool at swim temperature without using gas or electric utilities. 40. Install pervious pavers instead of concrete patios to allow water to percolate down to the water table, rather than run off into storm drains. 41. Run drip on pots from underside so you are not using your hose. 42. Use retractable awnings on the south and west side of your house to help cool the house. 43. Install a patio cover, pergola, or pavilion to help cool the house and garden. 44. Use motion sensors with lighting fixtures rather than leaving them on all night to save energy. 45. Reduce pesticide use by using natural predators like ladybugs and praying mantis to control aphids and other undesirable insects. 46. Proper landscape maintenance reduces rodents from visiting your garden. Keep lawns and groundcovers mowed regularly. Once they go to seed it provides a food source for flea-carrying rats and mice. 47. Build your barbeque counters and patios using cast concrete with recycled crushed glass and bottles. 48. Use synthetic decking and fence products manufactured from recycled materials instead of lumber. 49. Plant trees to act as windbreaks to protect your home from the heating effects of summer wind and cooling effects of winter winds. 50. Build your home office desk and furniture out of recycled wood and tree trunks like I did! Scott Cohen is an acclaimed garden designer, author, and licensed contractor in landscape, pool and general construction whose award-winning work has been frequently showcased on HGTV and in numerous books and magazines. A charismatic and entertaining speaker, Cohen is also the author of 10 design and construction books, including the award-winning Outdoor Kitchen Design Workbook, Poolscapes, The Candid Contractor, and Outdoor Fireplaces and Fire Pits. A 3 time Masters of Design Award winner, Scott has been featured on several Home and Garden Television shows such as Cool Pools and Get Out, Way Out! He also serves as a member of the California Contractors Board Industry Expert Program, as a construction defect expert witness for swimming pools, concrete, and landscape.